A rare opportunity for Southland motorsport fans is on offer! World Touring Car Champion Paul Radisich is set to speak on his experiences with Ford Motorsport at Bill Richardson Transport World on the evening of Friday, 16 February 2018. In what is set to be a great weekend for petrol heads in Invercargill, the ‘Celebrating Ford Motorsport with Paul Radisich Event’ is also coinciding with Invercargill’s ‘Evolution Motorsport Classic Speedfest Weekend’ (16-18 Feb 2018). Paul Radisich is well-known in Motorsport circles having competed in Single Seater Saloon Cars for many years — both European-style tourers and the V8 Supercars of New Zealand and Australia. Paul gained world-wide acclaim for his twice winning world title efforts at the Touring Car World Cup Events at Monza and Donington in 1993 and 1994. 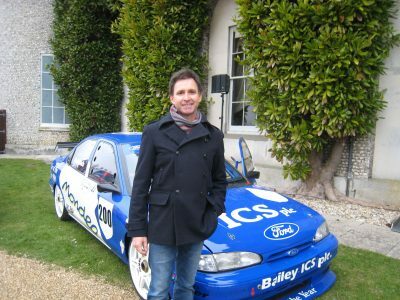 Paul was also a front-winning driver in Australian Touring Cars through the Ford Sierra Cosworth and Ford Falcon eras. To celebrate Paul’s arrival in Invercargill, Bill Richardson Transport World has also decided to celebrate Ford Motorsport in New Zealand with the creation of a brand new, temporary exhibit. Already widely known as a collection that has a long-standing passion for Ford vehicles, this new exhibit will house a full range of Ford competition cars from the 1960’s to present day. The new exhibit will be housed within Bill’s Shed, fittingly it will also be surrounded by 40 permanently displayed vintage Ford vehicles from 1896 – 1950. Paul will also be reunited with his 1994 Mondeo Super Tourer at Teretonga on Saturday, 17 February as he takes the grid in the historic touring car races. Scott O’Donnell, Transport World Trustee says “It’s great that we could get Paul down to Invercargill for such a good weekend of motorsport activities. I’m really looking forward to hearing him speak and to seeing the new exhibit come together. There are some great vehicles coming, so it’s great to have them in Invercargill and on display at Bill Richardson Transport World”.